The buildings in this triangle of land between roads are named after the Castle Hotel, at the top of the site. The hotel, in turn, was named after the passenger ship Rothsay Castle which was wrecked on Dutchman's Bank in 1831, with the loss of almost 130 lives. Timbers salvaged from the wreck were used to reconstruct and enlarge the old inn here, which was run by two widows from c.1730 onwards. The lower end of Castle Buildings, by the corner with Plas Gwyn Road, is the thin end of an architectural wedge. It features the date inscription 1883, and a rounded tower shape with a conical roof and miniature balcony. In the early 20th century the words Castle Hotel and Billard Room were written over the entrance, now the arched window used for display by Accent Properties. You can see this entrance on the left of the photo. 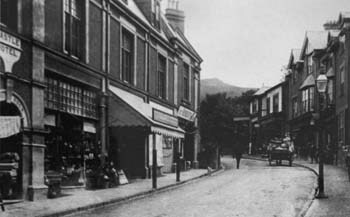 Plas Gwyn Road, also known as Pig Street, was originally the road from the early village towards the seafront. Station Road was built in 1868 to improve access to the rail station and seafront, and the hotel expanded to exploit the triangle of land. The hotel complex, including Castle Buildings, now boasted a dining room and snooker hall, to enhance its appeal as a stopover for commercial travellers. In the 1930s the snooker hall was sold to the local snooker club, and a social club (a way to get around legal restrictions on serving alcohol on Sundays) started in the old dining room. The club later moved to nearby Summer Villa, and then to the Heath. The shops around the site were built speculatively by the brewery which owned the site. They have included a bakery, jeweller’s, Social Security office, butcher’s and milk bar. The shops opposite were built from 1902. Castle Buildings is now occupied by local businesses and houses the headquarters of estate agency Accent Properties.